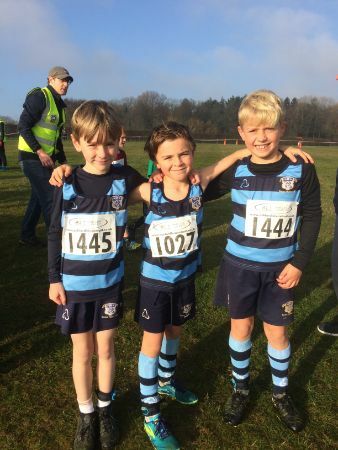 The boys’ teams got off to a cracking start as Freddie F, Freddie GR and James M lined up with 198 young runners at the bottom of the first incline. The first 200m comprised a gentle climb up to a pillbox, followed by a sharp right turn and a descent of about 100m before a long, taxing ascent of 300m. Cresting the ridge, the runners had a downhill run of 400m before turning for the finish line in front of the roaring crowds. Freddie F placed himself amongst the leaders from the start, with Freddie GR keeping his place amongst the chasing pack. 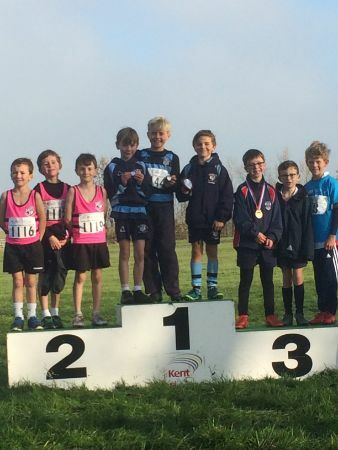 With James M only a few places behind, the boys finished in 4th(05:41), 8th(05:53)and 17th(06:04)respectively, securing first place, and the opportunity to stand atop a podium!